Despite its size, Belgium packs in amazing cultural experiences for every traveller. It is a small nation with a big role to play in European life and world history. Situated in Western Europe, Belgium is known for medieval towns, Renaissance architecture and headquarters of the European Union and NATO. The country has distinctive regions including Dutch-speaking Flanders to the north, French-speaking Wallonia to the south and a German-speaking community to the east. Belgium is a marvel of architectural theatre, glitteringly ornate and the historic centrepiece of one of the world’s most cosmopolitan cities; it never fails to inspire. Belgium’s bilingual capital, Brussels, is filled with decorative guildhalls and elegant art-nouveau buildings. You have only to look at two of the most prominent symbols of Brussels to sense that there is a touch of surrealism in the essential character of Belgium. The Manneken Pis – a tiny bronze statue of a little boy doing what his name suggests – is regularly dressed in one of his 800 beautifully made costumes. Then there is the Atomium: a colossal model of an iron crystal, with a Belgian flag protruding out of the top. René Magritte, Belgium’s most famous surrealist painter, has a dedicated museum in his name in central Brussels. 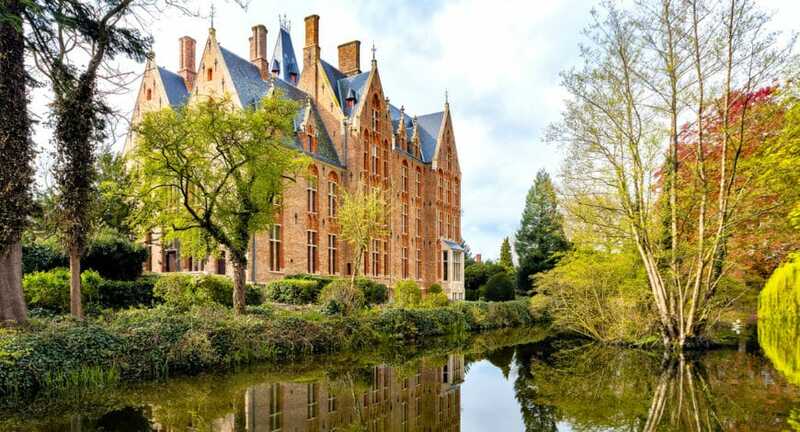 You’ll discover traces of Belgium’s past wealth, in the rich buildings of Bruges, Brussels, Antwerp and Ghent. These cities progressively fell under the control of a powerful and ambitious family: the Dukes of Burgundy. The realm of the dukes extended from the Low Countries to the borders of Switzerland. The Dukes of Burgundy aimed at reconstituting Lotharingia, part of the Carolingian Empire. The death of the last Duke, Charles the Bold, put an end to this dream. However, the treasures of the Dukes of Burgundy remain testimony of their rules in Belgian museums and landmarks. Belgium has survived difficult times too: in 1695 Louis XIV’s artillery demolished most of it. They aimed their cannons at the spire of Brussels’ Town Hall, which paradoxically was the only bit to survive more or less intact. The Bruxellois then rebuilt their Grand Place as it had been – a parable of the unconquerable resilience of this city. Belgium was briefly a part of the Napoleonic Empire. After Napoleon’s defeat, the entire region of the Low Countries was reunified as United Kingdom of the Netherlands. However, with religious opposition aggravated by political differences between Belgian liberals and Dutch aristocrats, Belgium finally became independent from the Netherlands in 1830. Belgium endured battle scars from German occupation during World Wars I and II and has many war graves near the battle zones. It has however prospered in more recent decades as a modern, technologically advanced and cultural country that is well worth the journey. All the above sites are visited on ASA’s Belgium tours.